The Irish cycling features the Breathlite 2 layer system; the base layer keeps your skin dry by wicking moisture away while the outer layer keeps your skin cool in hot weather. The Ireland bike jersey is further enhanced with two elasticized back pockets for storing gear while riding, an elasticized waist and a half zip front placket. 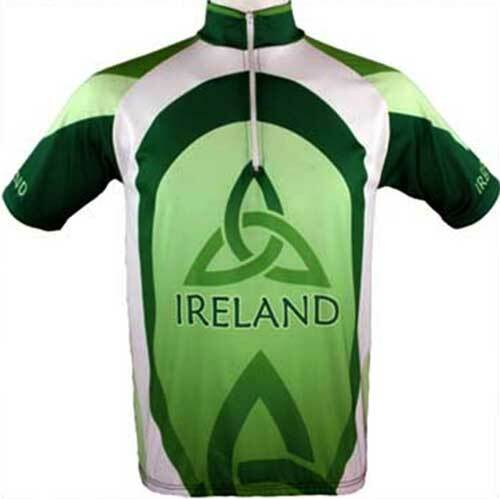 The Irish cycling jersey features a light-weight breathlite material with sublimation print of Ireland along with several Trinity knots on the front, back and sleeves. The Celtic bike jersey features a high-performance 100% polyester fabric and it is available in sizes extra small through 3XL. The Irish bike jersey is received with a Celtic knot history card, complements of The Irish Gift House.